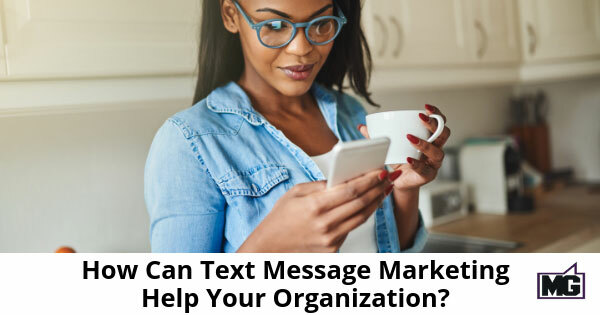 How Can Text Message Marketing Help Your Organization? Short Message (SMS) Marketing is perhaps the most underrated digital marketing strategy out there today. Despite having the highest open rates (98%), best engagement rates (90%), and extremely high conversion rates (23%), marketers continue to overlook this strategy. SMS marketing isn’t any more tightly regulated than email marketing or social media marketing. You can work within the rules and benefit enormously. Just one text every few days or 1x a week is enough to keep your customers thinking about your brand and not your competitors, particularly if you offer value and not just sales pushes. In a recent study by e-commerce company mShopper, it was found that B2C brands that send their customers one SMS every day see much higher conversion rates. What’s even more interesting is that consumers rarely click on links in their SMS messages. They just need to know what you have to offer. With this information top of their mind, when the time comes to make a purchase, they’ll only be thinking about one place – your business! Up to 90% of consumers open their messages immediately when they receive an alert. In fact, the average American checks their phone every 12 minutes even when there are no alerts. This gives you a perfect opportunity to drive campaigns for products or services that are available only for a short time or in limited quantities. For instance, you can send a message saying; “40% off on our tax accounting services. 12 hours left!” or something like; “Claim your 50% discount on Gucci belts. Only 20 left!” Since SMSs are read right upon delivery, interested customers will often take action then to buy. It’s no secret – customers like to share their opinions. It’s the reason social media platforms like Facebook and Twitter are full of polls – it makes your audience feel part of the decision-making process. SMSs make it easy to run polls and even contests. In the case of polls, send a short message asking the recipient to answer with a NO or YES for a certain question. For contests, ask them to respond to the message or send a new SMS to a given number to participate and get a chance of winning a grand prize! Customers want to feel valued. They want to feel you appreciate them. One way to show your appreciation is to send them exclusive deals. For example, send a text message saying: “Just for you, <Insert Name>; 30% off on the next purchase above $50.” Many consumers would jump at this offer. It doesn’t end there. Tie these deals to your drip campaign and send offers based on how long the consumer is subscribed to your SMS services. The average American spends 24 hours on the internet every week. This translates to around 3.4 hours daily. While it may seem high, it’s still less than one-sixth of the 24-hour day. Mobile phones, meanwhile, remain switched on and ready to receive SMSs around the clock. Marketers can capitalize on this opportunity to reach their audiences beyond computer hours. Unless the recipient is asleep or away from their phone (unlikely), they’ll see your message and read it right away. With these ideas and some creative experimenting with SMS sending services, you can reach, build rapport, and stay top-of-mind with potential customers to ultimately increase sales.